I bought this saw 25 years ago. I thought a review of this saw would be useful to people looking for good used machines on E-Bay and CL. It has been across the country in my many moves. I believe the price at the time was around $1100. I added a Biesemeyer 54” fence to it as soon as I got it. It has seen much use over it’s 25+ years. It still runs perfectly; bearings are tight; top is flat; everything remains aligned. I couldn’t ask any more from a saw. It would compare favorably with the best of the new saws. Due to it’s vintage, it doesn’t have the safety features of newer iron. 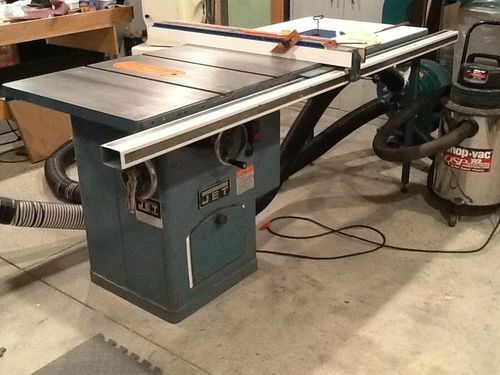 If this saw was up for sale, I would consider $600 to be a very good price for a very good saw. That must a be very solid and durable saw. Thanks for sharing. Appreciate the review on an old machine, if there was a whole organized series or category of these I imagine that all of the posts asking about used craigslist items (including my occasional ones) would fizzle out. Jet tools were made in Taiwan while others were made in China. I don’t know about their present line, but if price is an indication, they may still be made in Taiwan. I have the same saw, and love it. Been trouble free since I bought it of from craigslist. I agree 100% with the OPs review…. My CTAS is circa early 1980s, purchased used (and covered with surface rust) and rehabed by me. Long term reviews are awesome. I’ve considered reviewing a few old or vintage tools/machinery that are still commonly available on the used market. I also picked the saw up off of craigslist and I am slowly rehabbing the saw. Only things wrong with the saw when I got it for 100 bucks were a cut power cord, some surface rust on the table and the fence system was broken. I’ve fixed the first two problems and I’m getting close to getting a new fence put on. The machine it’s self works great though motor runs quiet and powerful. Here is an update on this saw. My original review was in 2013 and 4 years later, my original comments still stand. I use this saw almost every day. I cut wood of all sorts and aluminum plates. I did put on a new set of belts, but other than that, I haven’t done anything else to it. I do check things like blade to fence and blade to miter slot but have not had to make any major adjustments. The saw is still vibration free and the bearings appear to be in good condition. Remember, this is a saw that was made in Taiwan back in the 80’s, not China. I cannot speak for newer models of this saw. Since this saw has served me so well, there is no reason for me to ever buy a new saw. Off course buying a used machine of any kind has it’s possible perils. If the original owner mistreated it, it may not be the fault of the manufacturer. In my experience, Jet has made very high quality machines, but as I said, I cannot speak for their present line. They, being in the upper price range of the consumer grade of machine tools, leads me to assume they are still making quality tools.